选配: PP滤杯, 不锈钢滤杯(100ml, 300ml, 500ml), 不锈钢杯盖(300ml), 300ml不锈钢杯配件, 隔膜真空泵, 无菌滤膜, 火焰灭菌枪, 镊子, 镊子架, 抽滤瓶组件. They have been designed specifically for applications in which the particles or microorganisms retained on the membrane filter surface are of interest. Simple handling is very important regarding routine examinations. Stainless steel taps in the base allow the vacuum to be turned on and off. Stainless steel and PP funnel for choice. - Filter head is detachable, easy to sterilize key parts. - Multi-head support can be controlled individually. - Much bigger filtration area and much fast filtration rate. - Accept 47mm and 50mm membrane. 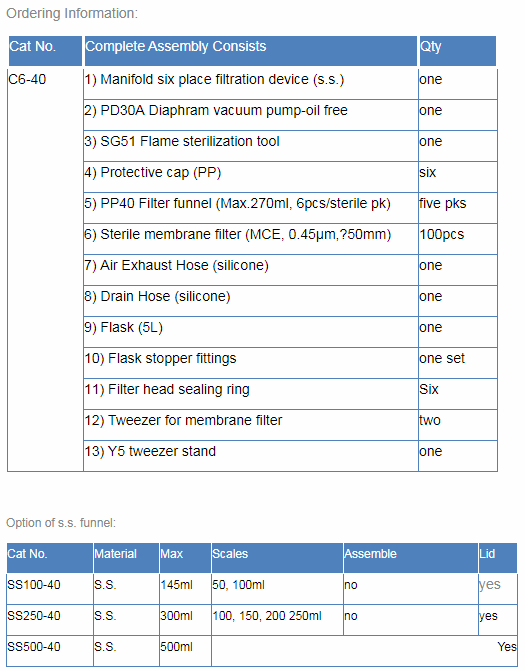 - Filter head accept flame fast sterilization. - Special groove in the filter head, easy to place /take off membrane. - Filtration support can be moist heat sterilization. a. Disease Control: Microbiological test for legionella,the public water and food. b. Pharmaceutical Industries: Microbial limit test and chemical analysis for pharmaceutical water, drugs and raw material. c. Food & Beverage: Bottled water, water in container, beer, beverage and raw material of liquid applied in production process. d. Filtration treatment in chemical, cosmetic, electron industries. f. Water plant, water supply and sewerage. Copyright © Hangzhou Geevo Technology Co., Ltd.